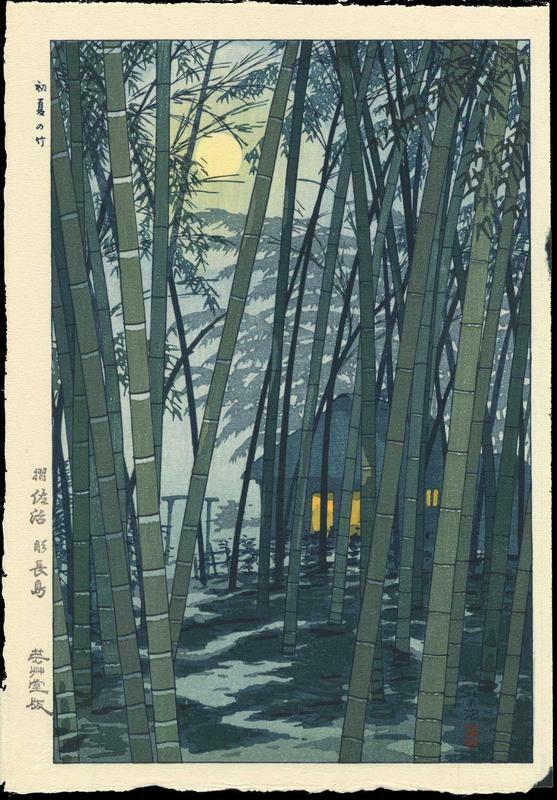 Kasamatsu, Shiro (1898-1991) "Bamboo in Early Summer" - Woodblock - Chinese and Japanese woodblock prints for sale, silkscreen, scrolls, watercolor, lithographs. Artwork Details for Kasamatsu, Shiro (1898-1991) "Bamboo in Early Summer"
Notes: In the left margin are title, Unsodo publisher's seal, printer's seal, carver's seal, and Unsodo 'Gei' watermark. Kasamatsu red seal in right of image. The cut-out in the bottom right corner (known as a 'kento cut') are due to the printing process.